This weekend really felt like the weather decided to turn that corner and march straight into fall! I’m so excited! I love fall! I love the cooler temps. The brisk mornings. Making big pots of soup. Chili simmering while football is on. Snuggling up on the couch and “resting my eyes” while football is on. The changing leaves. I sure don’t like raking them, but I love seeing the colors paint the sky and ground as they fall. I don’t mind the drizzle. I don’t mind a few cloudy days. I try to enjoy every second of fall, because we all know what comes next. I know fall is so short lived and you have to live it up and enjoy every moment! There’s this semi-recent Macy’s commercial that cracks me up every time. It’s of a lady who is walking by a restaurant and sees another woman wearing a dress or something and the lady drops everything and just pauses on the street, it progresses to other ladies doing the same thing with bags, and shoes and shows them basically tracking down the owner of “the item” to find out where she got the item. The commercial is titled “The Chase” and the song is “One Way Or Another” by Blondie in the commercial and it fits so perfectly. Here’s a link to it so you can see it! I laugh every time I catch this ad because that’s how I am. If someone has a bag, coat, eye glasses, shoes etc… I like, I usually try to look for details on the make and model, so to speak. If I can’t find a name on it, I’ll ask where they got it and my brain will bookmark that for some internet surfing in the near future (before my brain forgets it all together). Some times I have to make a note in my phone. This past fall, my husband and I were at a brewery restaurant waiting for our table and I noticed this lady’s coat. It was that lovely military green that makes me happy. 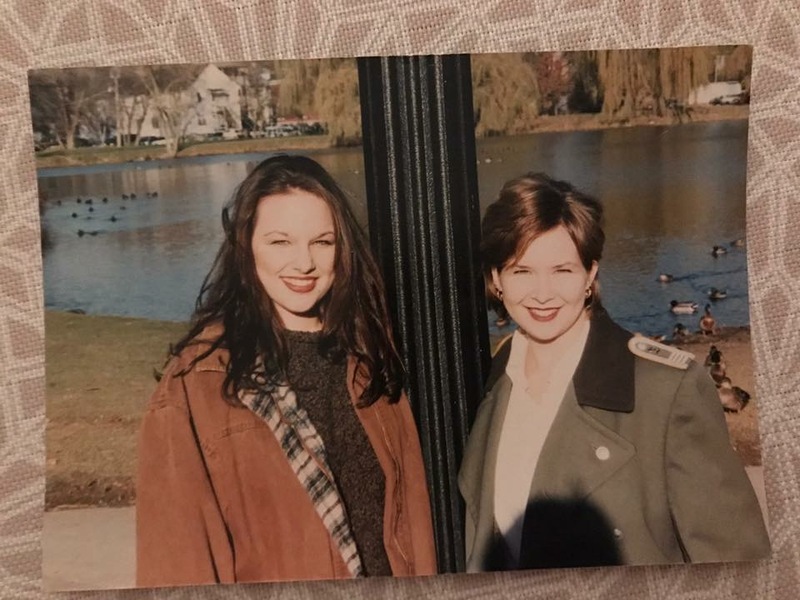 It had a military vibe, but had a feminine cut and I could tell it was not an old authentic military coat like the one I had worn in high school. I eyed her coat and had to ask her where it was from. She eagerly shared with me and even took it off to check the brand name in the tag. She said she had bought it several years ago at good old JCPenney. I think I was in a Google search for that coat by the time we were sat at our table. The coat was no longer sold anywhere and the brand was exclusive to JCPenney, so my only hope was second hand type sights like Etsy, Ebay, and Poshmark. I found a few, but they weren’t my size. I kept searching the next few days and we found one on Poshmark, but the seller wouldn’t respond to our eager desire to buy the item. The “Buy Now” option wasn’t working and by that time, my husband was worried that with each click of the Buy Now, it was charging us. But luckily it didn’t and we found the coat in my size. Ok, so it’s a petite and it’s a little snug, but it works and I love it. 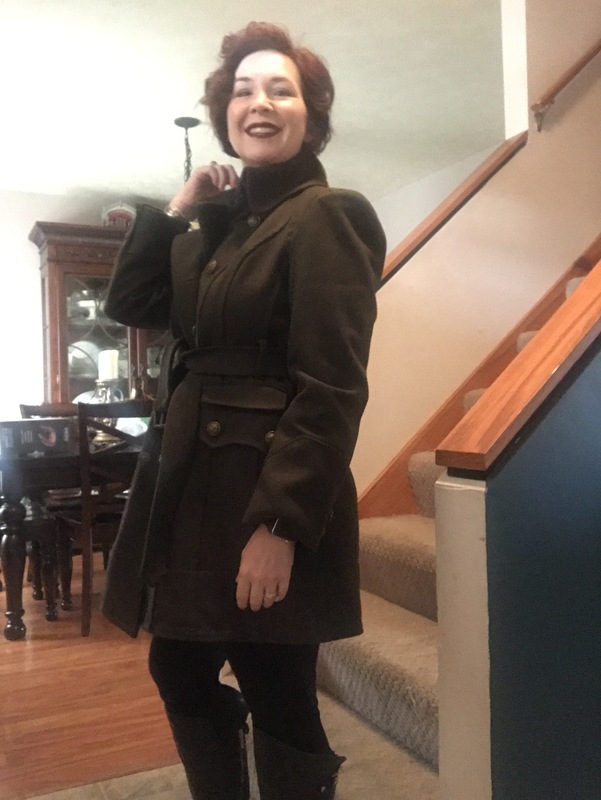 When my updated military-ish coat arrived, I tore it out of the package and tried it on and had my daughter snap a quick picture so you could see just how cool it is. So break out those fall boots and pumpkin spice everything – it’s fall and I’m so excited to wear this awesome coat! Ha!! I crack myself up!